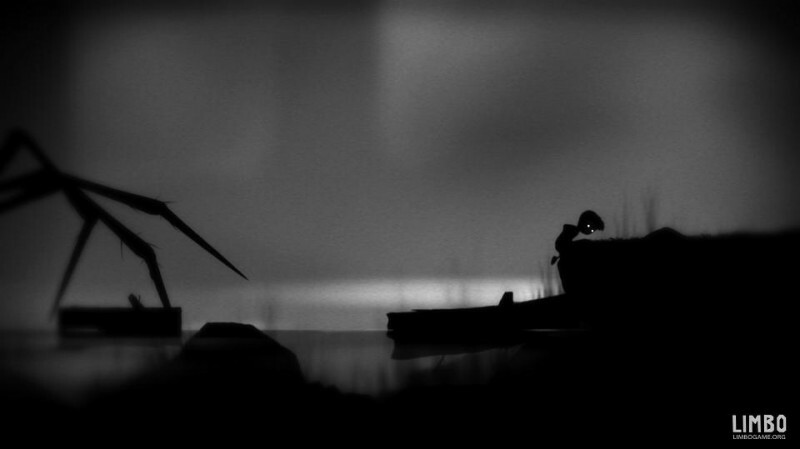 Dark and innovative, Limbo is a very unique game. There is no dialogue, written or heard, throughout the entire game. Instead, you wake up in a dark wood and must find your way as best as you can with no knowledge of WHY (unless you’ve read all of the other reviews out there, as I had). At first, the game seems easy and fun. Even dying (especially dying) becomes a source of amusement, as our hero with no name inevitably meets a gruesome end with every mistake we make. There are no lives, though; no penalty. You just dust yourself off and try again. With autosaving after every puzzle, I’m perfectly happy with this gameplay approach. The puzzles needed to progress become much more challenging, so that towards then end I was almost wholly dependent on pogle’s assistance to finish. Certain puzzles become so frustrating that, the minute you realize you’ve messed up yet again, you’ll find yourself running the hero into the nearest source of death with some satisfaction. Sweet ending, I guess, albeit truncated. Fun, in its own way. Unique environment. Little forgiveness in the later puzzles. Morbid. Bleeping sawblades. I had not seen the Back to the future movies since I was a young child, so except for a few scenes (lightning and the DeLorean, Biff marrying Marty’s mom) I really didn’t remember much. I was pleasantly surprised when, while watching Back to the Future, I could not stop laughing. Being older now, I finally got all those jokes that went right over my head when I first watched it. I loved it and I can sort of see why pogle was so astounded that I wasn’t more into the films than I was. Back to the Future II was okay, but not nearly as enjoyable as the first. Elizabeth Shue’s acting at the start does not help set the mood for the film, and Marty’s idiot actions are mostly just frustrating (no wonder he has the chance to have a kid like Marty Jr). The main highlights were the parallels they created with the first film (which is why pogle made me watch the two side by side). Once again, Pixar has managed to amaze me (and make me cry). Somehow they have made each Toy Story be as good as, and in this case better than, the last. An enjoyable film geared more towards an adult audience simply because children, while they’ll enjoy the action, will not have yet experienced the bittersweetness of growing up. Excellent movie. It’s been a long time since I’ve read the original books, but from what I remember the movie definitely followed at least the spirit of the books. I love how natural Toothless appears: you can definitely tell that they studied animals to get his movements down (he reminded me of a cat and our ferrets in his mannerisms). We promptly went and purchased the movie (on sale) as well the first few books in the series to read and share with the family. We made sure to watch the original short (included on the DVD) before watching the film. They certainly took inspiration from it, but the extended film was in the end much happier than the original short. I didn’t hate it, but I don’t have to watch it ever again. Not really a review, more a collection of thoughts of the film. Someone please send out a Jurisfiction agent to fix all of the plot holes. Conclusion: Not bad for SyFy. The plot was too loose, but I was still compelled to finish the film and see how it all ended. Haven’t done a movie review for awhile, so what the heck, have at ye. What’s the background of the Vampire Mafia? Who’s the little girl vampire? Why does the lead vampire not have weird creepy slanted eyes like all of the others? Why weren’t the vampires actually removing the victims’ heads like the leader instructed at one point, so that they wouldn’t turn? Be warned: the ending made me cry. I’ll forgive it, as long as I don’t have nightmares tonight. If you like horror vampires and you don’t mind lots of violence, not a bad movie. For those of us more easily shocked, I recommend a movie buddy (there’s no way I’d watch this by myself). PS: Josh Hartnett is totally turning into Tommy Lee Jones. Monster House: The CGI feels a bit primitive, but the movie does a good job of capturing a level of scary that I think a lot of kids could enjoy without having nightmares. Has some very humorous moments. Ratatouille: Good plot and excellent execution. It’s Pixar. Enough said. Shrek 3: Okay, so I don’t really think it lives up to 1 or 2. It’s a cute addition to the Shrek world, but I just feel the plot is a bit looser on this one than the others. Worth watching, of course, and still extremely enjoyable. The Simpson’s Movie: Hahahahaha. Very much like a longer, more thought out episode. We get to see some character development in several characters including, most surprising of all, Maggie. Very fun. Balls of Fury: While I abhor what I call “stupid humor” in movies…this movie toed the line very well. I was able to groan at it but not want to leave the room. Aspects of it were hilarious, and Christopher Walken is always fun to watch. Meet the Robinsons: I wanted the movie because of the TRex in the commercials; however, it turned out to be extremely awesome in a children’s sci-fi story way. I mean, come on, it features an evil hat named Doris, what’s not to love? Virtuosity: Weird movie about a virtual serial killer program that escapes the computer via an android body. Found the programmer far more creepy than his creation, however. Pretty run of the mill cop/chase film. Stepford Wives: The movie is inconsistent in parts with the technology aspect, but…very, very awesome in others. Watch just to see Bette Midler and Roger Bart, although the other main actors do a good job in the film. Also interesting is the fact that Faith Hill played one of the stepford wives. Stargate: An interesting take on Egyptian history. A very fun movie in a “The Mummy” tradition. Aeon Flux: As long as you don’t compare it to the original anime series (which I barely remember), I think you can enjoy this movie. I think they did an excellent job with their version of a dystopian future world, and it was very interesting to watch. Ultraviolet: A B Movie that’s fun to watch as long as you enjoy it for what it is: a B Movie. Some of the dialog literally had us cackling, and the gun storage method was pretty innovative in a Sci-Fi sense.